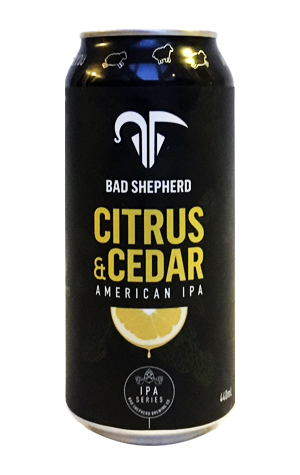 When conceiving a beer for the 2018 GABS Festival Container Bars, Bad Shepherd resisted the temptation to do anything particularly crazy and instead decided to use it to launch a new IPA series. The launch beer is Citrus & Cedar and will be followed by a new IPA in cans and kegs every three months. In creating it, they opted for a quintet of hop varieties known for their citrusy or piny, woody characters (or both at the same time) but didn't stop there. The beer was also fermented with orange and grapefruit as well as Spanish cedar. And it's a combination that has led to one of the most olfactory-dazzling aromas we've come across from a hoppy beer in a while. There's heaps of citrus – lemon, grapefruit and orange rind – while the cedar adds a floral, woody spin. It really is one to stick your nose in and leave it there for a while. Once you've managed to withdraw your proboscis to actually swig some of the beer, there's less time to indulge such flavours as a biting, drying bitterness comes at you fast and reminds you this is, despite its fancy bouquet, a feisty American IPA at heart.